I was so tired last night that I slapped up the previous shot on the blog without much fuss. Upload image. Press save. Done. Sleep. This post is a bit more deliberate. I stopped by the Dutch Creek farms just as the light was waning from the sky last night. I shot several scenics and distance scenes of the horses in the fields with my BRAND NEW Nikon D300. Suddenly I felt like I was being watched. 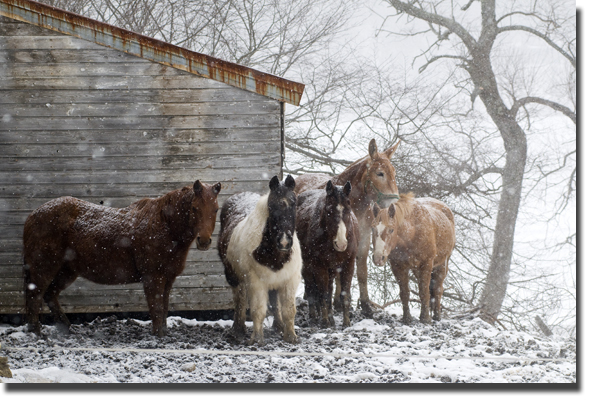 I turned around and saw this cluster of ponies tucked against the barn, with snow laden backs, staring at me with such sorrowful eyes. Naturally, I pointed my BRAND NEW Nikon D300 right at 'em and pulled the trigger. Anyway, I'm just reporting that yesterday was a good day. I mean, how could it not be? 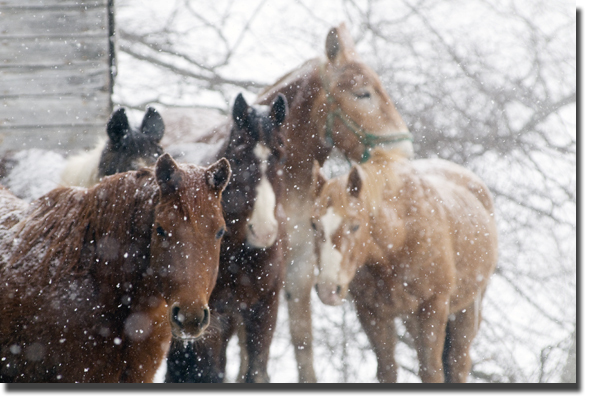 I scored a BRAND NEW Nikon D300 and I got to see fuzzy ponies.